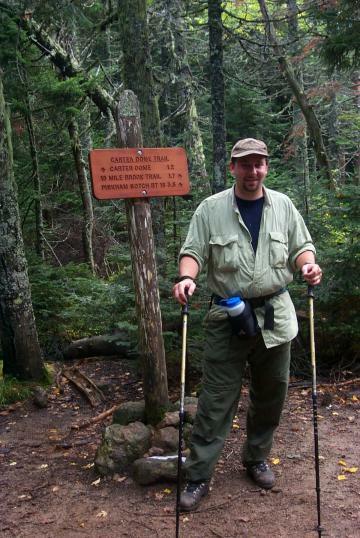 Throughout most of the summer of 2001, we were just too busy (lazy) to get out and go hiking. So, in typical fashion, we decided that one giant hike which bags four 4,000 footers (that's 16,000 feet!) in one weekend was the best way to make up for this. It became apparent quickly however, that our legs were following a completely different plan than our minds. The idea was to start at the trailhead of the Nineteen Mile Trail on route 16 early Saturday morning, and head about two miles up the trail to the junction of the Carter Dome Trail. The maps indicated that this area should be relatively flat and we hoped to find a good site to set up a base camp. At that point we'd drop our packs, grab a fanny pack and a water bottle, and hit the summits of Carter Dome and Mt. Hight in a quick day hike. Then back to base camp for a hot meal and a good night's rest before setting out on Sunday morning for a day hike to bag South Carter and Middle Carter. After that, just hit base camp again, grab the packs and head for the Smokehouse. Sounds easy, doesn't it? We actually got on the road early on Saturday morning and things looked like they were going to go smoothly. The weather report said it was supposed to rain, but although it appeared cloudy, it didn't look like any big storms were going to hit. Additionally, traffic through Conway was light, there weren't too many leaf-peeping Massholes clogging up rt. 16, and we didn't forget anything important so we didn't have to turn around half-way to Conway. What more could you ask for? When we pulled into the trailhead parking area at around 9:30AM, we found it crowded. There was still a spot or two left, bur there were certainly more cars than we expected. Make a note of this -this parking lot serves the main trails to the AMC Carter Notch Hut so there will almost always be a crowd. Anyway, we dropped the parking fee in the slot (new for 2001 -you can pay for up to 5 days worth of the recreational parking fee at most major trailheads; $3.00/day), and started up the trail. The temperature was probably in the low 60s, the sky was overcast, and there was barely a breeze. The main weather related problem was the near 100% humidity. Just breathing made you sweat and everything was damp in no time. 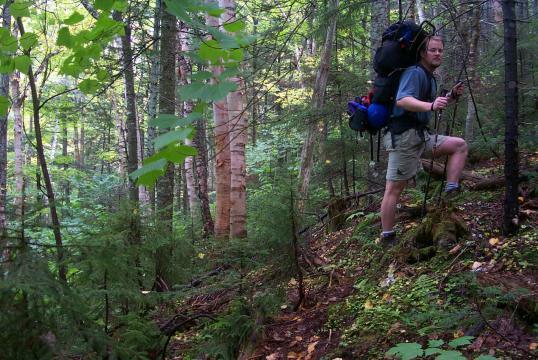 The beginning of the trail was an easy hike; the first � mile is a very low grade and the trail is in decent shape. 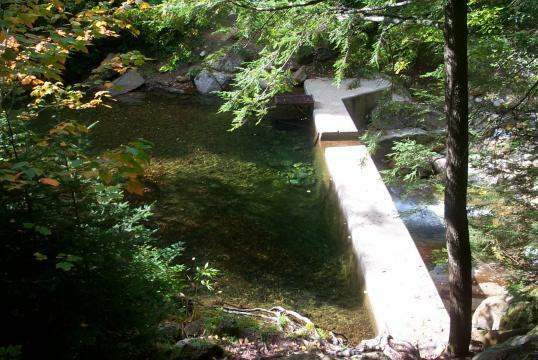 The Nineteen Mile Brook stays on your right side for most of the initial hike to the junction of the Carter Notch Trail. The scenery along the brook is great and there looks like there are a number of places where one could stop and take a cooling dip or fill a water bottle. Make a note that this is one of the few hikes in the Whites where obtaining water won't be a problem. At about the first mile, there is a damn in the brook on the right side of the trail. Nothing special about it -- just an interesting landmark to let you know you're about � way to the trail junction. We reached the junction and turned up the Carter Notch trail at around 11:45 -- a 2 hour walk that covered 2 miles this far. Not bad time for the terrain. We passed a few people along the way, but the trail was certainly not crowded. At this point, we dropped our packs and began looking around for a suitable campsite. 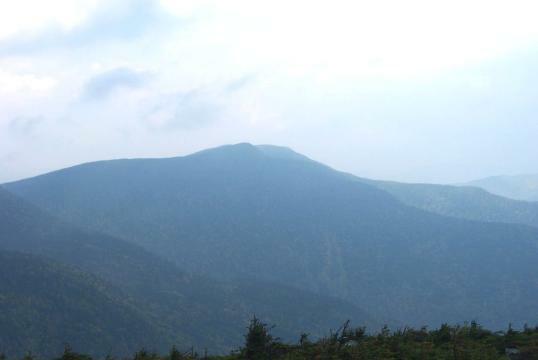 The junction of the Nineteen Mile Brook Trail and the Carter Dome Trail is a pretty interesting location. The Nineteen Mile Brook is fed by a tributary and this creates a unique convergence of the terrain, similar to a 3D delta. There is plenty of water to be found, but in the drier months, it may not be bountiful. As we hunted around for a suitable place to camp, we stumbled upon an existing site just on the opposite side of the brook from the Carter Dome Trail. It was perfect. Plenty of room for two tents, flat, a fire ring was right there, and it was easy to get to. So we did the only sensible thing we could. We walked right past it and kept looking. Why? We'll tell you. What's one of the most important rules in finding a suitable campsite? (Click here if you don't know)? Stay at least 200 feet away from trails and water! After a little more effort, we found a suitable site about halfway in between the Carter Dome Trail and the continuation of the Nineteen Mile Brook Trail. We set up camp, ate, and headed out for the summit of Carter Dome. 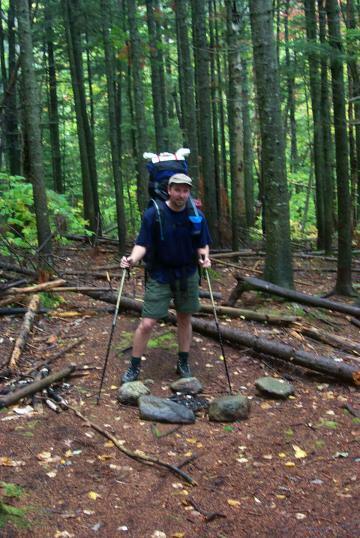 The Carter Dome Trail continues on a gradual grade, although somewhat steeper than the Nineteen Mile Brook Trail. After crossing the tributary to the Nineteen Mile Brook several times, the trail gets slightly steeper, makes a few switchbacks, and works its way up to the Zeta Pass (which we were affectionately calling the Catherine Zeta Pass). Just before the pass on the right is a reliable source of water, which is well marked. 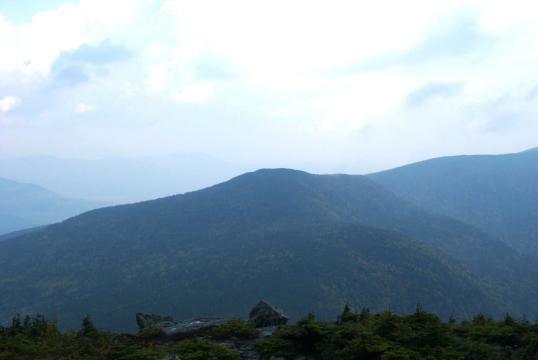 This is where the Carter Dome Trail ends and you join the Carter Moriah Trail, which is part of the Appalachian Trail. There is a little bench where you can rest your aching feet, have lunch, or just cool down. From the Catherine Zeta Pass it is a fairly short 30 minutes to the summit of Carter Dome, up a gradual, sometimes rocky slope with some excellent views to the West. The trail follows the base of Mt. 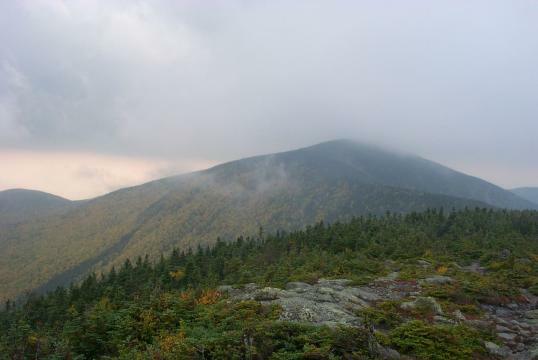 Hight for about � mile, then ascends Carter Dome through the trees until you hit the summit, which is not bare, but only has short brush for foliage. (OUR ADVICE: Take the Carter Moriah Trail to Carter Dome first, then go to Mt. Hight. The trip up the cutoff to Mt. Hight is STEEP and treacherous!) Views can be had here in 360� and all are supposed to be excellent. We couldn't tell because it started to pour rain as soon as we summated, and we were socked in the clouds. The only views we were to get were from Mt. Hight. 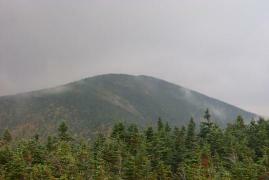 Having an aversion to pouring rain, we left the summit of Carter Dome and headed towards the cutoff to Mt. Hight. At 4675 ft., Mt. Hight should be an honorary four thousand footer, but isn't. The walk along the ridge back to Mt. Hight is easy, and easy to follow. After 20 minutes of easy walking, we made it to the summit of Mt. Hight, which was spectacular. This is perhaps one of the best kept secrets in the White Mountains! The views were great (360�), the summit is big and open, there are plenty of place to sit and eat lunch, and best of all, there aren't a ton of people there! We spent a few minutes at the summit, bagged some pictures, and moved on. We decided to take the cutoff back to the Carter Moriah Trail to save some time, and that was quite a trip! 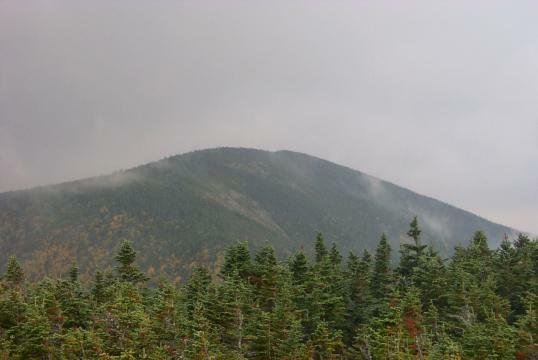 The trail is very steep, but we managed to get back to the Carter Moriah Trail, back to the Zeta Pass, and down to our camp near the Nineteen Mile Brook Trail in about 1 � hours. We ate, slept and prepared for the following day. Sunday we awoke at a decent hour, but something was amiss! The weather was perfect! Sunny, 70� F and low humidity. But there was something else wrong as well. Our legs were killing us! Rob had a knee issue that was really bothering him, so we decided to keep a low profile, eat breakfast, take our time breaking camp, and head out. The South and Middle Carters could wait for another time. 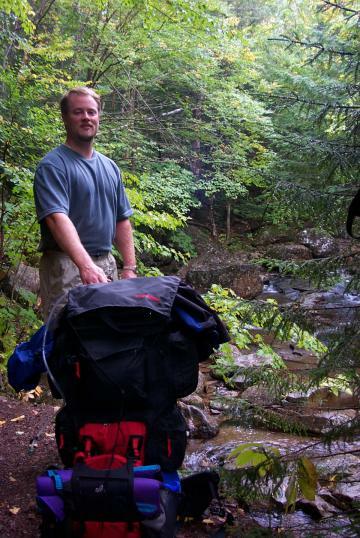 So, we packed up, headed down the Nineteen Mile Brook Trail and enjoyed a leisurely walk out. After about two hours we were at the truck, and in another 90 minutes we were at the Yankee Smokehouse enjoying our traditional post-hike eats.